1. Give your post a Title in the first text window under Add a New Post. 2. For SEO (Search Engine Optimization) purposes, Change the URL of your post to include keywords for your product, service or city. Now you should see a second row of icons. The first icon in the second row is Formating for Bold (B), Italic (I), Strikethrough, Bulleted Points (unordered and ordered), Blockquotes (“), Alignment, and Links. The second row contains Headings (Paragraph to Heading 6 in the drop-down), Underline (U), Text Justification, Text Color (A) and options for Pasting Text. Under the Grey Bar is a space to add Text/Copy and Images to your post. Click and Drag over any text where you want to change the format then select formatting buttons from above. Tip: Remember to separate Headings with a row of blank space below them before formatting so that nearby text will not be affected. Tip: The best way to keep consistent formatting is to copy and paste existing text then edit the newly copied words. On the right-hand side of the dashboard, you should see a “Categories” window. If the whole window is not displayed and you only see the word “categories”, hover your Mouse over the right edge of the grey bar to see a drop-down arrow and click on it to expand the window. All windows are expandable except for the body window. All Windows can be dragged by their title bars to new positions in your browser window. Now you should see available categories for your post. If you do not see a suitable category, look below the window to see a link to “ + Add New Category“, click there to add your category. Click on the check box next to a Category to have your post appear there (may already be checked if you just added a new category). PUBLISH your work by clicking on the Publish button above! Click on Settings in your Dashboard on the left-hand side. Then, click on “Reading” in the Settings Sub Menu (underneath Settings). 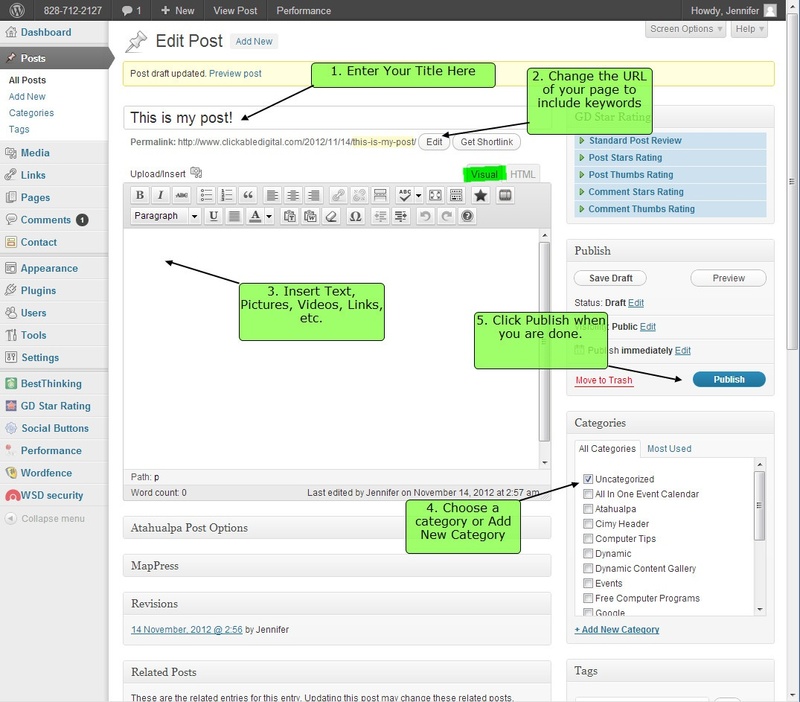 Click on Appearance in the left-hand menu of your Dashboard. Then, click on “Widgets” in the Appearance Sub Menu (underneath Appearance). On the rght-hand side, you will see dark grey bars titled “Left Sidebar” and “Right Sidebar” (you may even have inner sidebars – but rarely used). Click on the grey bar of the sidebar where you want your categories for posts displayed. Find the “Categories” widget and click and drag that to a position in your sidebar. If you hold the category widget above or below another widget title, you will see a dotted rectangle appear as a space holder for that position in the sidebar. Release your mouse button at the appropriate place. You can always reposition the widget later. Give your widget a Title if you so choose (ex. Articles, Categories, Blog) and leave the available check boxes unchecked or choose to show your categories as a drop-down menu, etc. SAVE changes. Check the “front end” of your website to make sure it looks good to you.